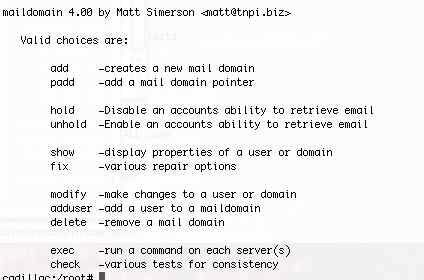 mailadmin is a command line interface to nearly everything you can do with the vpopmail programs. It is designed specifically for provisioning systems and has been extended to allow non-root users (ie, technical support staff) to make changes to the mail system which would otherwise require elevated permissions. It also includes a bunch of handy fixup utilities for qmail systems. Where do I find the maildomain script? This is now part of Mail::Toaster and has been renamed mailadmin. If you have installed Mail::Toaster recently, you'll find the latest copy in /usr/local/sbin/mailadmin.